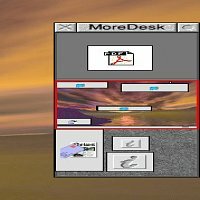 Below are some examples of how various MoreDesk users have configured their copy to look. 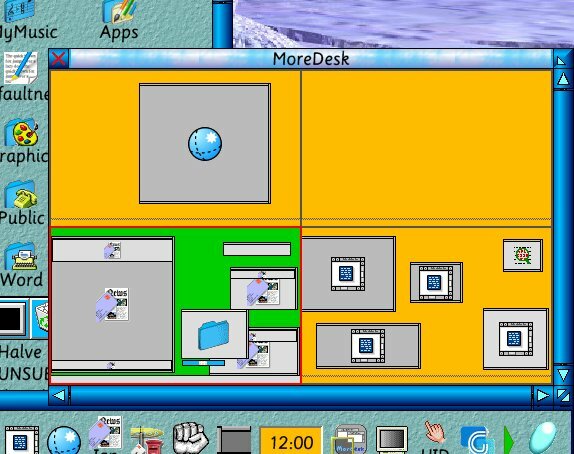 It helps to illustrate not only the range of configuration options in MoreDesk, but the number of different ways that people have found of using the virtual desktops concept. Click on the images for larger versions. A clean and simple look, with a 5 by 3 grid of desktops and no backdrop association. 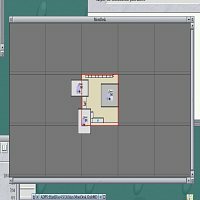 Note: most windows are concentrated in the ‘home’ desktop. 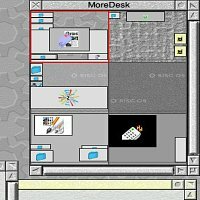 The MoreDesk main window looks like it is in the centre of the screen. Another clean look. This time with a 4 by 2 grid of desktops. This user has spread their windows over three of the desktops and left some free for further expansion. 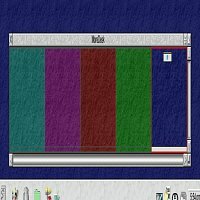 The main window also appears to be centred on the screen. 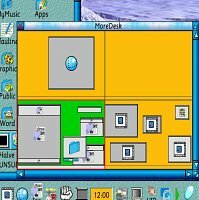 This user has set up a single row of five desktops. 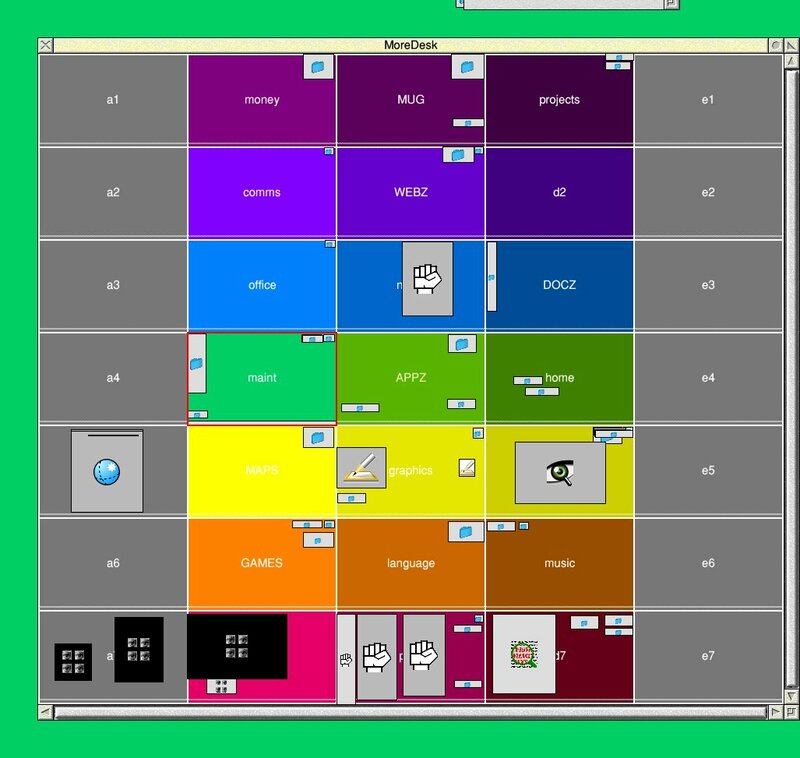 These are colour-coded by having a different colour background tile image. They also have the main window down low, just over the middle of the iconbar. Quite a radical colour scheme, with the current desktop highlighted in green. This user has email, web browsing and development work going on in different desktops. The main window is sitting over the right-hand end of the iconbar. Three desktops with pretty backdrop images. 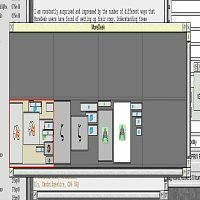 Each image is very different which gives a subtle reminder of where the user is in the overall desktop space at any given time. Here are some more pretty backdrop images, this time with a couple of ‘spare’ desktops placed at either end, presumably for the odd extra task when the main three desktops are getting crowded. The main window is sat near the right-hand end of the iconbar. Note how small it is. This time we have three desktops arranged in a column rather than a row. The main window is up against the right-hand edge of the screen. 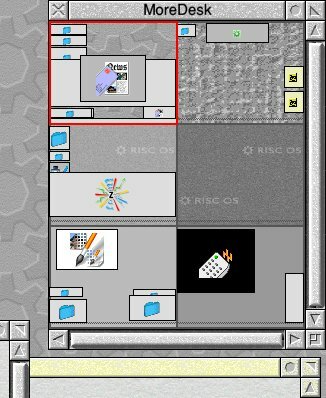 Lots of desktops, all with a subtly different background tile image. The main window is in the top-right corner of the screen and there is lots of activity in most of the desktops. 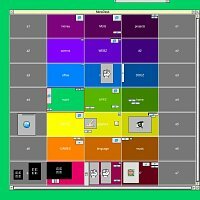 35 desktops in a 5 by 7 grid! This is a serious challenge for remembering where you are in the desktop space. To help out, desktops can be colour coded and given names. The author's own MoreDesk setup; a 4 by 4 grid of desktops (although that increases when I'm very busy!). Frequently used desktops are named and most windows automatically open into the correct position when I enter the desktop. Note: a single panoramic photo split over four desktop backdrops in the top row creates an interesting effect.